An employment contract can be a useful tool to protect your business while providing clarity and structure for your employees. 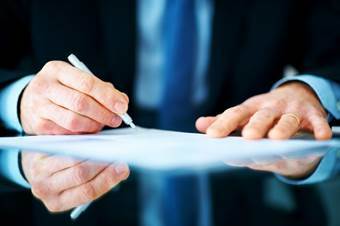 An effective agreement should clearly spell out the terms of both employment and termination. In this post we’ll take a look at the basics of creating an employment contract. A well-designed contract outlines an employee’s roles and responsibilities. What tasks is the employee expected to perform? What does the job pay? What benefits will the employee receive? Clearly stating this information upfront will protect your business from future lawsuits, provided you abide by the contract. You’ll want to be specific that the employment relationship is at-will. This means either the employer or the employee can terminate the agreement at any time for no reason. If instead it is not at-will, you should be sure to spell out the grounds for termination. One thing to keep in mind is what happens after an employee is either terminated or leaves. Who owns the right to any material he or she produced? What about confidentiality? An employment contract can protect your business by safeguarding its intellectual property. Besides offering reassurance, an employment contract can be a great way to attract new talent. Think of a contract as an offer sheet. You’re providing a prospective employee with job security and a clear path to success. Contracts can also make it easier to manage employees. The expectations can be laid out for all to see, which means there’s less gray area. Unfortunately, not all employees work out and a contract can avoid any confusion between employer and employee as to whether it is working out or not. make it easier to terminate employment should the need arise. If you’re thinking about putting together an employment contract, contact the professionals at Structure Law Group. We can help you create something that is specific to your business and adheres to the law.